Garmin GPSMAP 78 CASE made in the USA by GizzMoVest LLC. A lightweight, Military-grade semi-rigid, All-molded ase featuring a molded thick protective skin made from a composite of a textured hard rubber and shock absorbing foam. (impervious to water and floats!). 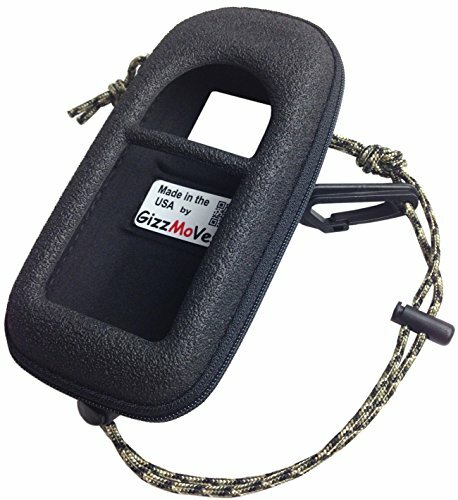 The strong removable Belt Clip is compatible with the GizzMoVest Ram Mount Adapter (sold separately).The adjustable lanyard with safety clip enables the device to be worn around the neck or secured to your equipment. Backed by the manufacturer's 3-yr. Warranty against defects and workmanship. Please search Amazon for other colors. NOTE: IN-STOCK. Recieve it in 2~4 days most anywhere in the continental US by 1st Class Mail ! GPSMAP 78sc, 78s and 78 CASE Made in the USA by GizzMoVest LLC in Tactical Black. Deeply-recessed screen opening maximizes protection for your GPSMAP 78. Easy zipper access to battery. Rugged, yet lightweight - 2.8oz. If you have any questions about this product by GizzMoVest LLC, contact us by completing and submitting the form below. If you are looking for a specif part number, please include it with your message.